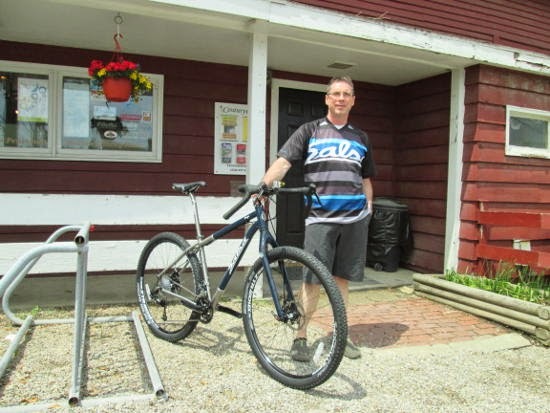 Century Cycles Blog: Salsa Cycles customer in Peninsula comes back for more! Salsa Cycles customer in Peninsula comes back for more! Meet Mark, a customer in our Peninsula store. On Monday, he picked up his new Salsa Cycles Salsa Cycles Fargo Ti bicycle, and is ready to take it on endless adventures. The bike features a titanium frame and carbon fiber fork, Stan's NoTubes rims with DT Swiss hubs, Schwalbe Racing Ralph 29er tires, SRAM drive train, and Avid disc brakes. Nice jersey, too, Mark! Mark also bought a Salsa Mukluk 2 from us a few months ago, and enjoyed riding it almost every day this past winter in his home town of Ashtabula, where they got even MORE snow than we did here in the Cleveland area! As one of Northeast Ohio's exclusive Salsa Cycles dealers, we've got a wide selection of Salsa bikes in stock in our three stores, including the Fargo 2, Fargo 3, Vaya 2, and Vaya 3, plus a Mukluk 3! Stop in and check them out!